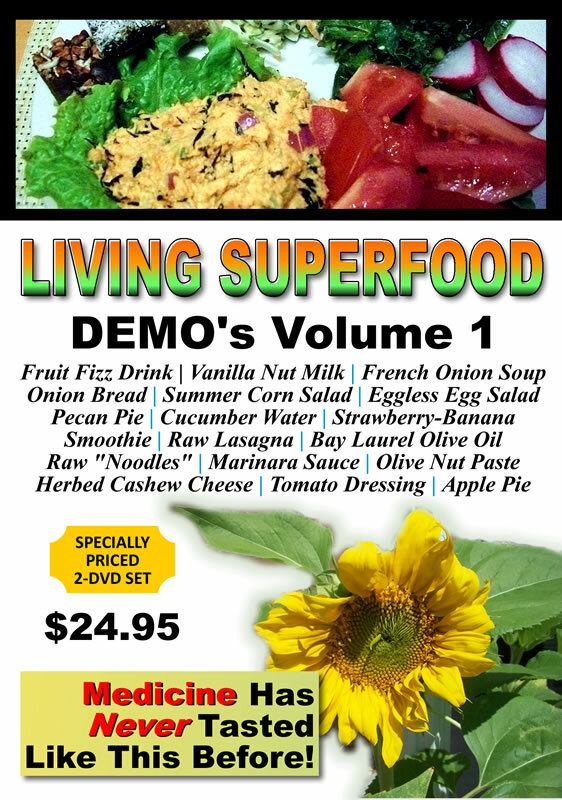 We have a whole line of superb Superfood demonstration DVD's with Chef Keidi and friends. Click here to get the two-DVD set. Click here to get the DVD. Living Superfood Demo 20 - Our latest Superfood preparation class included the following delights: Citrus Refresher, Living Almond Milk, Chocolate Banana Milkshake, various chips AND raw peanut butter sampling, Corn Salsa, Matchstick Veggies, Asian Salad Nori Sushi, Eggless Egg Salad, Coco-Choco Date Nut Bars, along with a vast amount of food science, Living Superfood insights, testimony and hilarious moments. You do not want to pass on this DVD recorded Christmas Eve, 2011 in Los Angeles.